The final piece of AMD’s return to high-performance computing is in laptops. 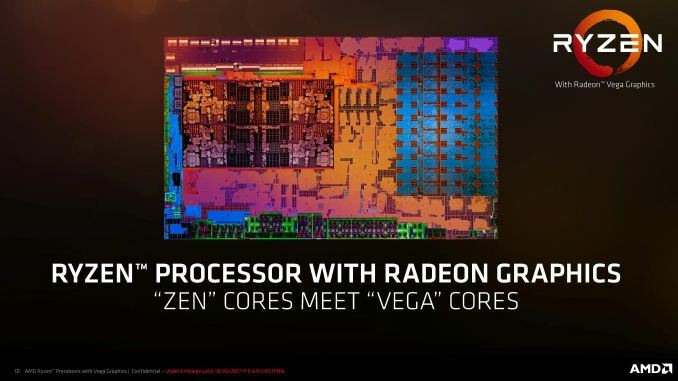 While Ryzen, Threadripper, and EPYC have used the 8-core Zeppelin building block for their products, the laptop side of the equation will combine the new high-performance Zen core with the latest Vega graphics in a single piece of silicon. AMD is now set to release the results of their efforts: a single silicon chip offering four Zen cores, up to 10 Vega compute units, and a unified power delivery system all in under 15W, with AMD touting +200% CPU performance and +128% GPU performance over its previous generation of laptop processors. HP, Lenovo and Acer are releasing laptops based on the Ryzen Mobile hardware today (or soon), and we expect to see more OEMs at CES in January with their offerings. To start, AMD is launching a pair of low-power processors for the laptop market: the Ryzen 7 2700U and the Ryzen 5 2500U. Both of these processors combine four of AMD’s latest Zen cores, with some minor improvements, with AMD’s latest Vega graphics, into a single piece of silicon. These are both 15W processors, using the U-suffixed nomenclature that Intel has popularized for its 15W parts. By developing around a 15W TDP, AMD is aiming for the same range of thin and light notebooks that are currently almost entirely Intel-powered, while also using the Vega graphics architecture as a significant selling point in gaming and enthusiast workload acceleration. AMD has also gone into detail about a number of power-saving technologies that is has developed and implemented to provide better battery life. Both APUs will have four CPU cores and simultaneous multi-threading, giving eight threads total. The rated base clock for the processors will be in the 2.0 GHz range, although AMD states that the typical all-core turbo will be much higher than this (more about it later). CPU boost frequencies are 3.8 GHz for the Ryzen 7 2700U and 3.6 GHz for the Ryzen 5 2500U, which sound very high for 15W processors but AMD has stated that this frequency combination is more in the efficiency sweet spot for the processor design. Like its competitor, OEMs can use these processors in configurable TDP modes, which AMD states are from 9W to 25W. We are under the impression that these power modes do not change the frequencies, but merely affect the turbo profile which we’ll discuss later. 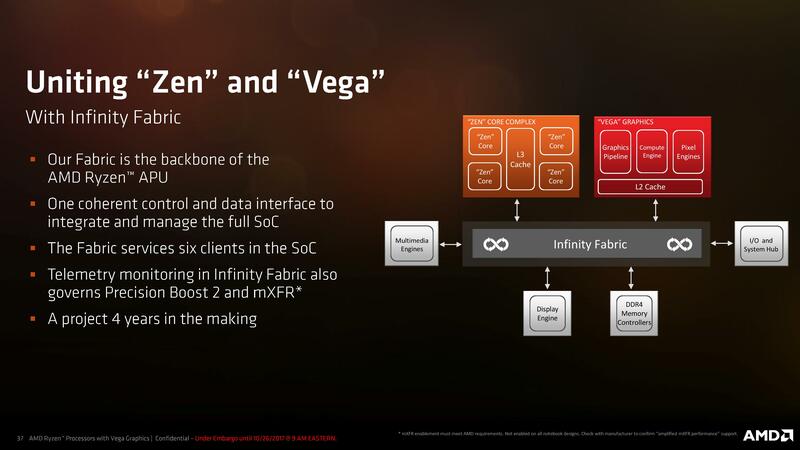 The four cores will be in a single core complex (CCX), which AMD states will alleviate some of the questions about CCX-to-CCX latency that were present in the dual CCX design for the desktop processors. There is another cutback compared to the desktop: there is only 1MB of L3 cache per core rather than 2MB, giving a total of 4MB of L3 cache. AMD’s Zen cores use L3 victim caches, which for most CPU-based workloads have little effect; however the speed of this L3 will be important when it comes to using the integrated graphics. The single silicon design has 11 Vega compute units onboard, of which the Ryzen 7 2700U will be able to use 10 of them, and the Ryzen 5 2500U will be able to use 8. These will be called ‘Vega 10’ and ‘Vega 8’ graphics respectively. AMD does not provide the base frequencies for the graphics, but does state that the maximum frequencies for the parts will be 1300 MHz and 1100 MHz respectively. One of AMD’s key discussion points in our briefings was around the ability to shift power between the CPU and the GPU to keep the maximum performance at all times. Memory support for both processors is up to dual-channel DDR4-2400; although AMD stated that it will be up to the laptop OEMs to decide whether to sell the devices with two memory modules. Some of the feedback the OEMs get is the requirement to ‘potentially’ upgrade the memory inside at a later date, which necessitates shipping single channel devices and leaving a memory slot free, rather than replacing two memory modules at once. 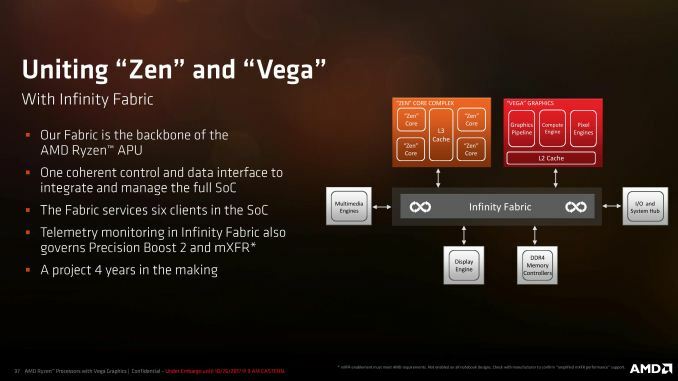 The new Ryzen Mobile processors use AMD’s Infinity Fabric interconnect between the CPU and GPU segments, which runs at half the clock rate of the memory, and AMD states it offers better bandwidth and lower latency than PCIe. When we get the final press releases in hand there will be specific news stories for each of the laptops coming to market, but AMD shared some information ahead of time about how AMD is returning to thin and light notebooks that actually have a proper design ID. As we stated back in our analysis of the Carrizo platform, there were plenty of users who were interested in AMD APUs but in an Envy or a Swift-like chassis, rather than the bulky plastic reduced price parts that vendors were putting out instead. 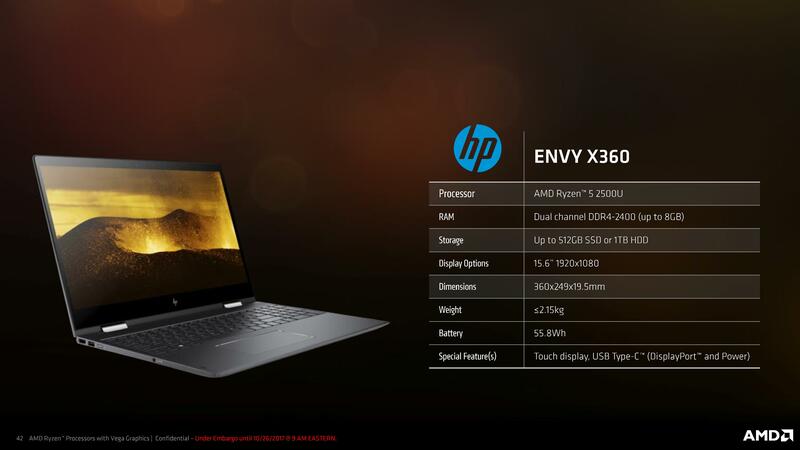 So the big plus here is that we get an HP Envy x360, an Acer Swift 3, and a Lenovo Ideapad 720S with Ryzen Mobile. The HP Envy is actually the biggest notebook of the three, offering a 15.6-inch 1080p IPS screen and dual-channel DDR4-2400, with a 55.8 Wh battery. Storage will be offered with SSDs up to 512 GB and HDDs up to 1TB, although we are waiting to know if that SSD storage is SATA or PCIe. At just under 5 lbs it is going to be a bit heavy, but the x360 part of the name means it has a rotating hinge, allowing for it to be used as a tablet or a tent, with a touchscreen as well. Power is provided over USB Type-C, which also supports the DisplayPort alt-mode. Pricing will start at $699 and it will be shipping from November. The Lenovo system is the smaller one, coming in at 2.5 lbs, and offering either a 1080p IPS screen or a 4K (UHD) IPS screen. We were told that this design uses a repurposed chassis from an Intel version, but will be offered with both the Ryzen 7 2700U and the Ryzen 5 2500U processors. 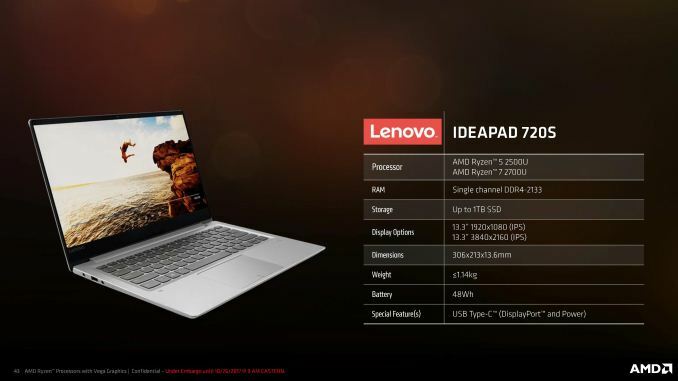 As with most popular notebooks, the Ideapad 720S will taper to a point at the edge, but at its thickest point it will be around half-an-inch – it has been a while since we saw an AMD notebook at that size. Lenovo will support a 48 Wh battery and Type-C charging with a DisplayPort alt-mode, with storage up to 1TB of SSD (again, no mention of SATA or PCIe). The downside is perhaps the memory support, at DDR4-2133 and only single channel with no room to upgrade to dual channel. Ultimately Lenovo is going to promote this for productivity that is not memory bandwidth limited over gaming. 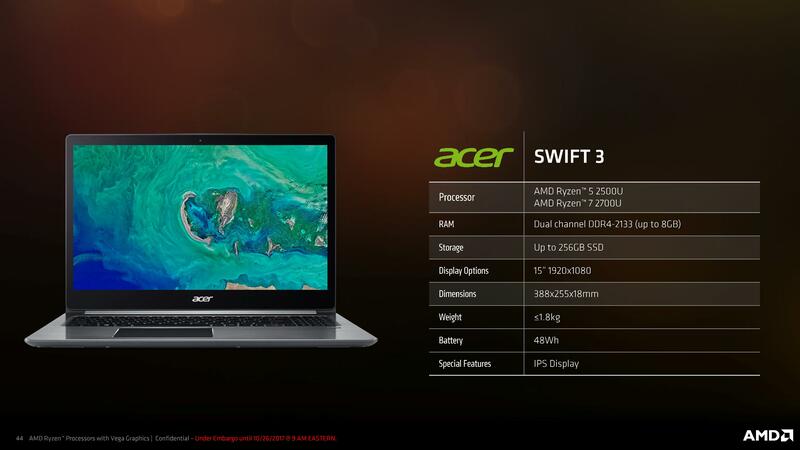 The Swift 3 is a little different than the others – we were told that Acer has built this chassis to dissipate 25W of processor power rather than 15W, meaning that Acer is going to be taking advantage of longer turbo modes and better performance numbers than other Ryzen Mobile parts. It will come with a 15-inch 1080p display, although it will not be offered in touch screen, and storage will be up to 256GB of SSD (again, no mention of SATA or PCIe). Memory will be dual channel, although the system will only support 8GB of DDR4-2133, and there is no mention of potential upgradability there – we’ll wait for the final press release. 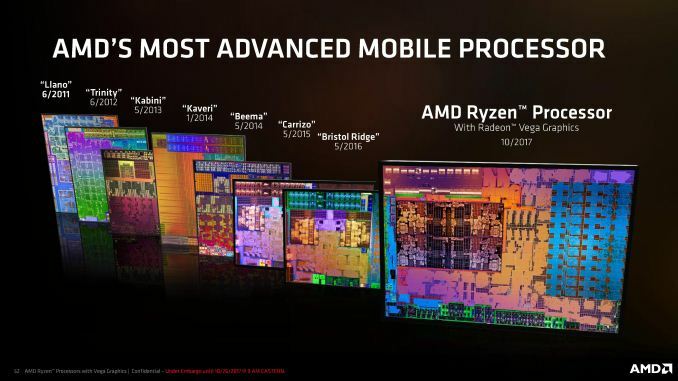 Aside from the on sheet specifications and upcoming devices that will be using these parts, AMD also provided some performance metrics, some updates to the SenseMI technologies for Ryzen Mobile, as well as a look into the new power regulation system developed for these parts, a lot of which are upgrades to the basic AMD Zen design that will be featured in the next generation of desktop processors. We will cover these in the next few pages. A 12" tablet with Ryzen APUs please!